Summer is still a few weeks away and yet, the temperatures are soaring and the need to quench a thirst and stay hydrated is priority number #1 especially with gardening and lawn mowing chores that are as never ending as dishes, laundry and oh yeah, feeding everyone. While water is my go to liquid I’ve been experimenting with “healthy-ish” alternatives that are simple, delicious and take almost no time to whip up. 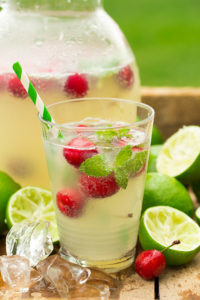 I started with lemonade, graduated to lemonade with mashed fresh fruit (watermelon, berries and pineapple) to land on my new favorite, limeade. 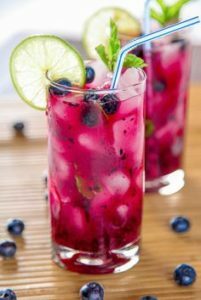 Limes are kinda the bridesmaid of citrus fruits, always there but never the star so without further ado here are several awesome recipes that will quench the heat inspired delusions that it will only take twenty minutes to mow your lawn. I love the no-cook citrus sugar syrup technique. You use the citric acid in lemons, limes oranges or grapefruits to dissolve sugar without cooking. The flavor is more intense (because of the essential oils) than a sugar syrup made by cooking than one made with just water and sugar. Roll the limes against a counter top to soften. Over a large glass bowl cut the limes in half and juice them, save the juice. Cover and refrigerate it. Cut the rinds into quarters and place them in the bowl making sure you catch all the extra juice as you are cutting them. Add the sugar and mix to coat. Cover again and let stand for 30 to 40 minutes. Mix to coat and repeat the process until all the sugar is melted and the lime rinds are softer. It should take about 3 to 4 hours but you and put it in the bowl just before you go to bed and let it sit over night or up to 12 hours. Add the 3 cups of water and the lime juice the sugar rind mixture. Mix to combine. Let sit for 10 to 15 minutes and then, through a fine mesh strainer, pour the liquid into a pitcher. This is your concentrated limeade. This mixture is great, being held in the refrigerator, for about 10 days. When you’re ready to make a tall frosty glass to drink. Place 4 to 6 ice cubes in a glass, add about 2/3 cup concentrate and then 2/3 to 3/4 cup of water. Mix to combine. Taste and add more concentrate or water to taste. Just remember, ice melts and it will dilute the mixture a bit. Garnish with you choice of fruit. Put blackberries and blueberries into a pitcher and mash them slightly. Add the crushed pineapple and mix to combine add the ice then add the apple juice and red wine. Mix to combine and serve. Makes 6 to 7 servings. This recipe can be doubled or tripled. In a sauce pan combine the sugar, lime zest and water and bring to a boil. Reduce heat and let the mixtures simmer for 3 of 4 minutes. Cool for about 5 minutes and strain into a pitcher. Let the mixture cool for about 15 minutes. Add the lime juice, puréed strawberries, watermelon and mix to combine. Add the ice, club soda and mix to combine. Add the sliced strawberries and serve. Serves 8 to 12 depending on how much club soda you add. That looks pretty delicious! Could have used one today! Your Black and Blue Sangria sounds perfect, refreshing and very tasty. I like your use of whole fruits.